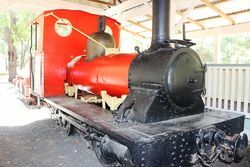 The steam engine `Kate` is a memorial to the pioneers of the timber industry. 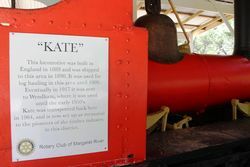 Kate was a locomotive built in England in 1889 and shipped to Margaret River in 1890. It was used for log hauling until 1909. Eventually in 1917 it was sent to Wyndham where it was used until the early 1950s. 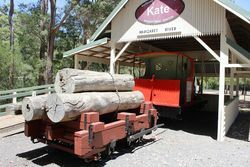 It was transported back to the area in 1964 as a memorial to the pioneers of the timber industry in the Margaret River District. During the late 1800's to early 1900's, the M.C.Davies Co. became the biggest timber producer in the colony, producing over 30% of all Australian timber exports, making timber Western Australia's second largest export, behind wool. The London streets of Pall Mall, Piccadilly and Regent were paved with M.C. Davies karri blocks from Boranup Forest. 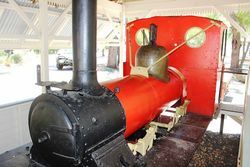 This locomotive was built in England in 1889 and was shipped to this area in 1890. It was used for log hauling in this area until 1909. Eventually in 1917 it was sent to Wyndham, where it was used until the early 1950`s. Kate was transported back here in 1964, and is now set up as a memorial to the pioneers of the timber industry in this district.